A young couple got engaged while they were renovating this town home with jewel tones and antique finds from Paris. 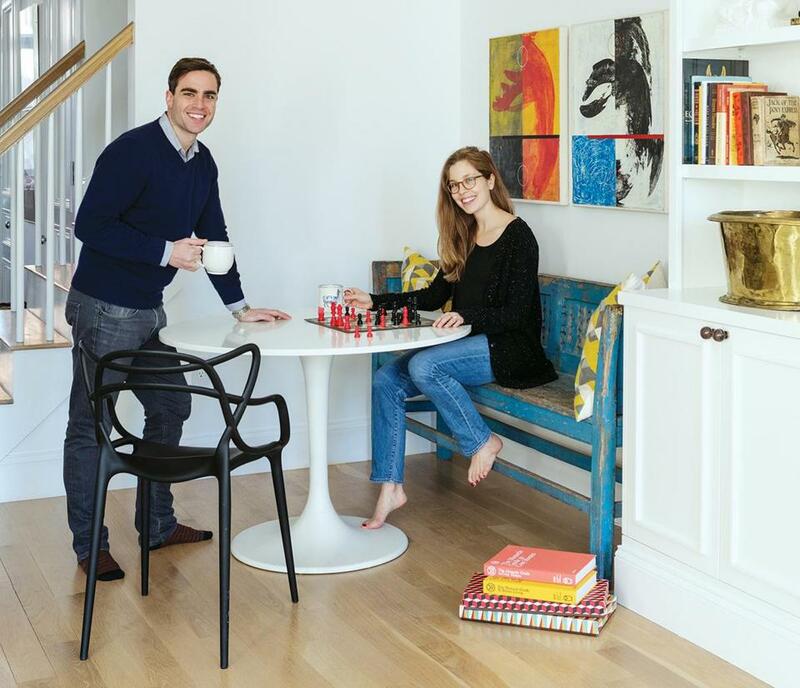 Homeowners Andrew and Caroline Corkin play a game in a niche off the living room. Caroline sits on a bench they bought at an antiques market in Paris. “The vendor told us it was 18th-century Swedish, but we’ve since learned it’s actually 19th-century Czech,” she says. The artwork is by Michael K. Bisbee. Shortly after making an offer on the unit, they ran into interior designer Michael Ferzoco of Eleven Interiors, a longtime friend of Andrew’s father. 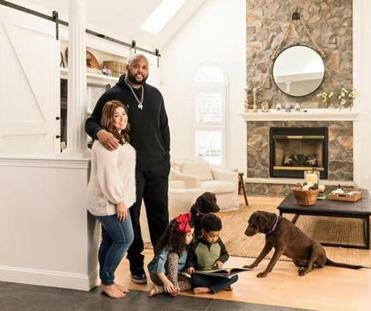 By that fall, they had hired Eleven Interiors to overhaul the 1,868-square-foot town home. “Seeing Michael that day was serendipitous,” Andrew says. Interior designer Michael Ferzoco designed the built-ins that flank the fireplace in the living room. Brass picture lights add an Old World touch. 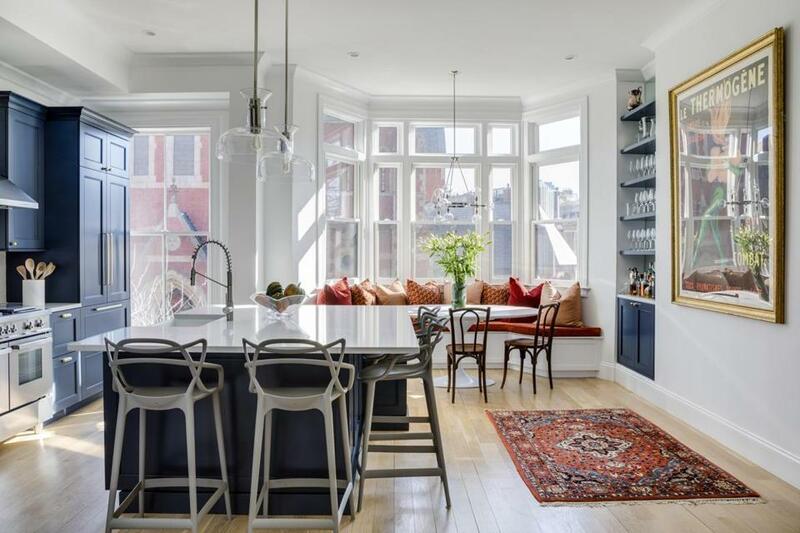 Like the kitchen, the living room, which has a view of the Charles River, is comfortable and elegant, ideal for everyday living and entertaining. A Restoration Hardware sectional stretches out across from the fireplace, and the television is mounted above. To Ferzoco’s dismay, Andrew, an independent film producer, wasn’t interested in hiding the electronics. “He didn’t even want me to inset it,” Ferzoco says. 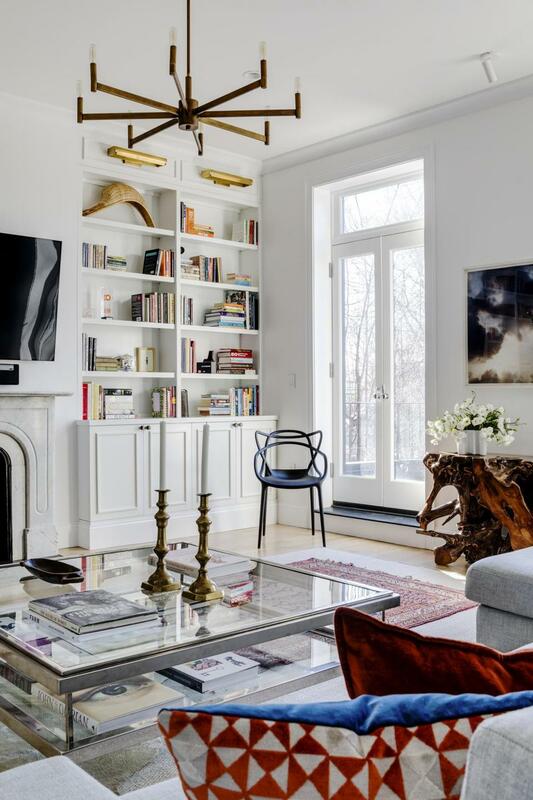 New built-ins, a 1970s Italian coffee table from the Paris market, a teak-root console, and artwork from Andrew’s and his father’s collections meld seamlessly. Upstairs, Ferzoco and Ballard created a new master bath, minus the bizarre picture window that had given the tub a view into the bedroom. The master bedroom is sumptuous, with a tufted blue velvet upholstered bed against an accent wall covered in geometric-print wallpaper. A John Baldessari print, a 30th-birthday gift to Andrew from his mom, hangs between the windows. The couple married last fall, following a proposal that Andrew staged while the house was under construction, complete with a metallic gold graffiti message, candles, and rose petals obscured by sawdust. “It was just after the  election, and Caroline was really upset,” Andrew says. “When things are at their worst and the world seems unpredictable, it’s much clearer to know who you want to spend your life with.” She said yes. 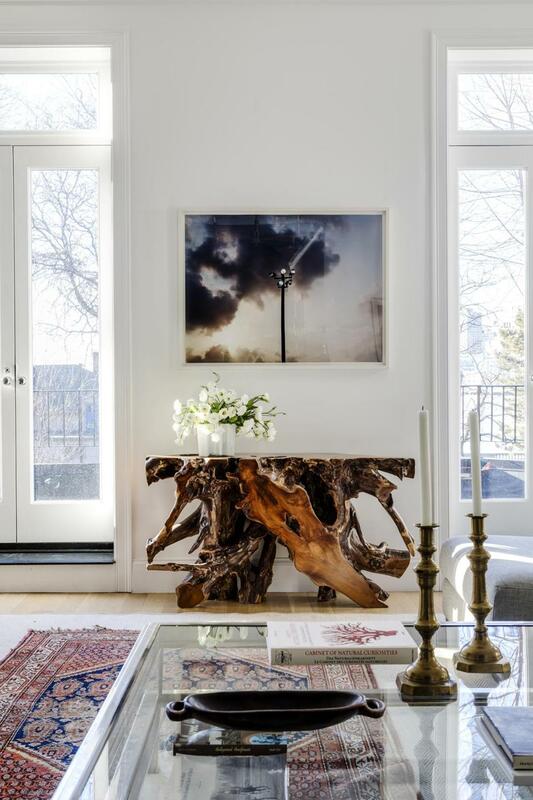 In the living room, a photograph by Charles Cohen hangs over the High Desert Root console table from Wayfair. The vintage Oriental rug warms up the room, painted Benjamin Moore Chantilly Lace. The tufted headboard of the Restoration Hardware platform bed is upholstered in slate blue velvet. 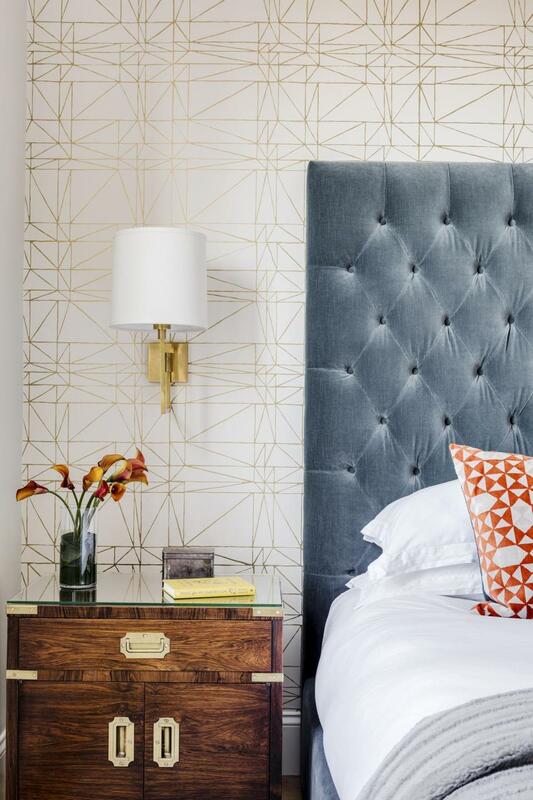 Caroline chose the gold metallic geometric patterned Hygge & West wallpaper. The vintage John Stuart campaign-style nightstand is one of a pair Andrew already owned, bought online from InCollect. 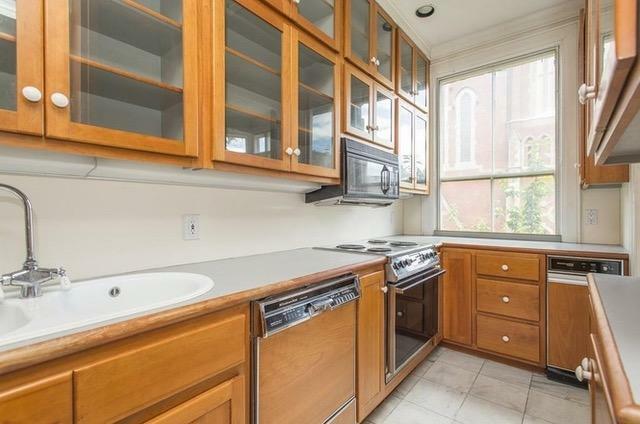 AFTER: The bay window in the breakfast nook overlooks the street. The funky Kartell Masters counter stools echo the lines of the vintage wooden bistro chairs opposite the banquette. Sculptural lights in clear glass — Hudson Valley Lighting Coffey pendants over the island, and a Garim chandelier from Kichler over the table — don’t interfere with the decor or the view.